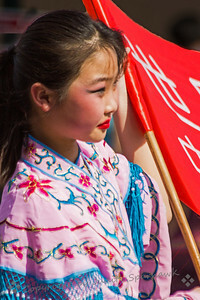 Girl with the Flag ~ This pretty girl was part of the parade last Saturday, for the Lunar New Year celebration in LA's Chinatown. 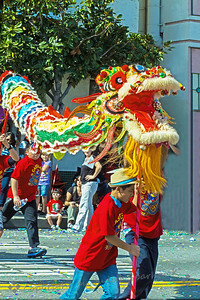 Dragon in the Parade ~ There were several dragons in the Golden Dragon Parade, part of the Lunar New Year Festival in Chinatown in Los angeles. This was one of the dragons in the parade. 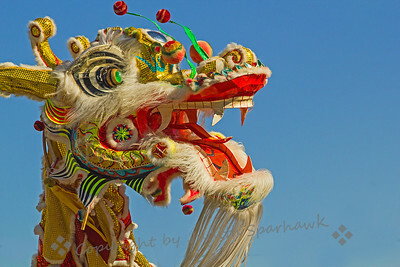 Parade Dragon ~ This was one of the larger dragons in the parade in Chinatown in LA. The crowd is looking on, and using "poppers" filled with confetti. 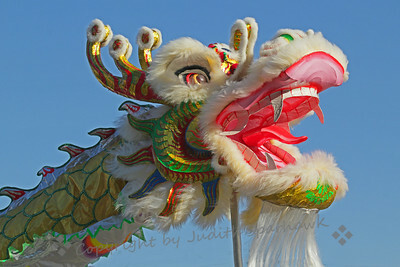 ~ The dragons in the New Year's Parade were winding in and out and around the parade route. This one came winding close to where I was standing, so I got a close-up view of it. 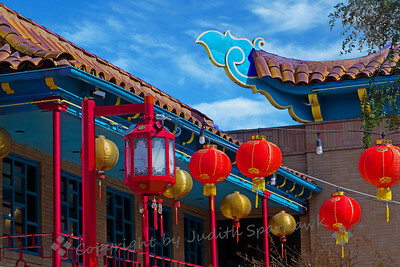 Central Plaza Scene ~ Los Angeles Chinatown's Central Plaza is filled with buildings of Chinese archtectural details, lanterns, merchandise. This is one view of the plaza. The Dragon That Took a Bite Out of LA! 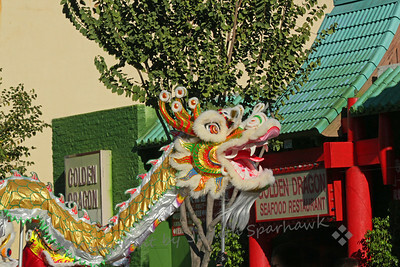 ~ A visit to Los Angeles's Chinese Lunar Parade today, resulted in numerous dragon photographs. I had fun with this one, which after I saw it on my computer, made me think of a giant dragon taking a bite out of the cityscape. At the Parade ~ This beautiful little girl was sitting on her father's shoulder, an onlooker at the Chinese Lunar Parade today. I liked her pretty face and the closeness shown between father and daughter. 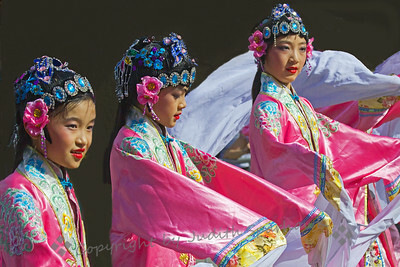 ~ These dancers were three of a group of Chinese dancers in the Lunar Parade in Chinatown, Los Angeles. 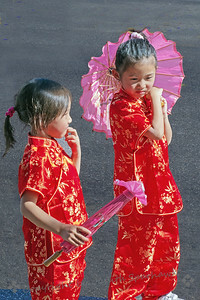 ~ These children were playing at the side of the street, waiting for the Chinese Lunar Parade to come by. 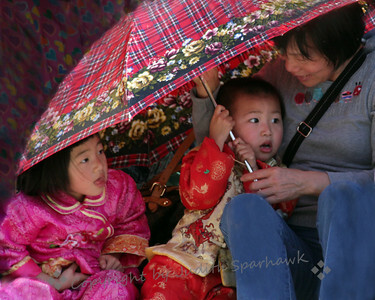 I liked their matching outfits and parasols. 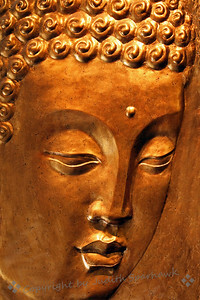 ~ This beautiful bas-relief sculpture was in a restaurant in Chinatown, Los Angeles. I sneaked two quick shots of it as I walked out the door, after a delicious and inexpensive lunch. 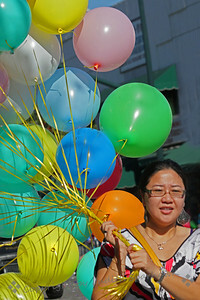 The Baloon Lady ~ The woman walked by sporting all these balloons--it was fun and colorful. 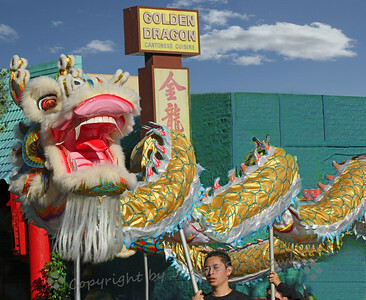 The Golden Dragon ~ Another view of the gold dragon going by in the parade, across from the Golden Dragon restaurant. 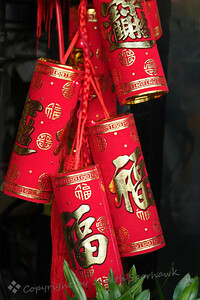 Red Lanterns ~ The shops along the streets of Chinatown had many red and gold decorations for sale for the New Year. 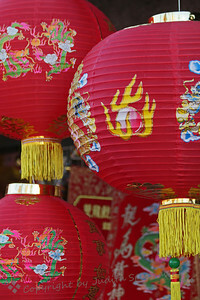 These red lanterns caught my eye as I walked by. Chinese New Year Decorations ~ More red and gold for sale in the Chinatown shops. Everything was so festive and decorative, it was a treat to stop by, camera in hand. 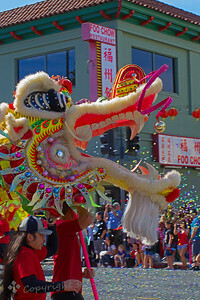 Year of the Dragon ~ I went to Chinatown in Los Angeles yesterday for the Chinese New Year's Festival and parade. 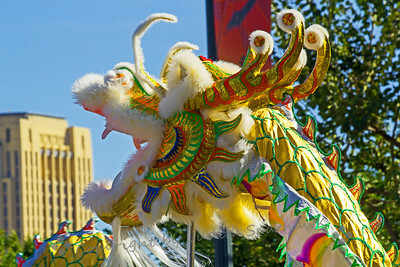 Being Year of the Dragon, there were many dragons featured in the parade. This was one of my favorites. 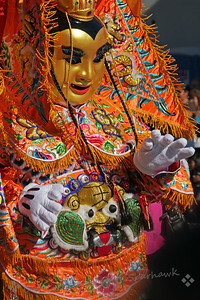 New Year's Parade ~ This was one of the costumed features of the parade. There was so much color and noise and excitement, it was a really amazing experience. 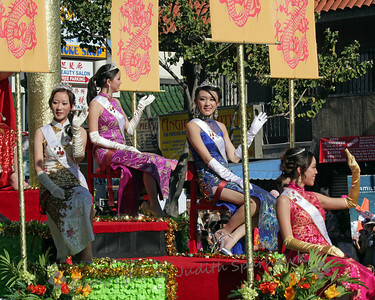 So Much Beauty ~ This was one of the floats in the New Year's parade. These lovely ladies added a touch of beauty to the day. They were dressed and presented beautifully. 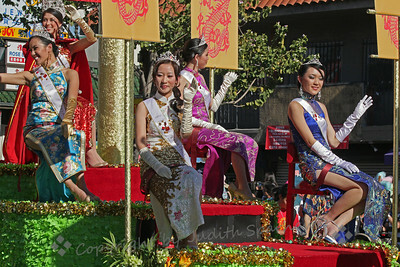 Festival Royalty ~ Another view of the parade float presenting these beautiful young ladies reigning over the festival. Waiting for the Parade ~ All along the parade route, people were sitting on the curbs, and standing along the sidewalks. This little family caught my eye, as they were shading themselves from the bright sun, and waiting for the parade to come by. My Dung Shop ~ My apologies to those who have language skills to know the true meaning of this shop's name. It caught my eye as I walked down a side street; however I didn't feel encouraged to drop in to purchase my produce. 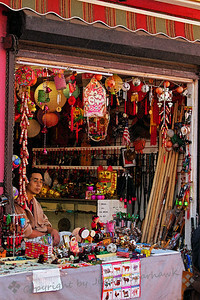 The Bamboo Merchant ~ This sidewalk shop featured various things, but the bamboo was most prominent. 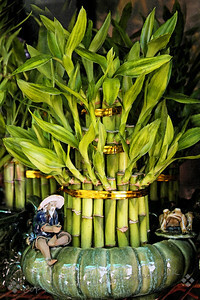 Bamboo is considered lucky, and can be purchased in very large to very small plants. 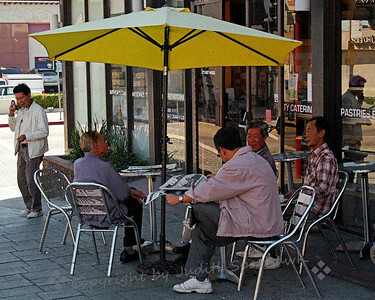 Lazy Saturday Morning ~ These men were hangin' out, reading the papers and talking, outside the Wonder Bakery. 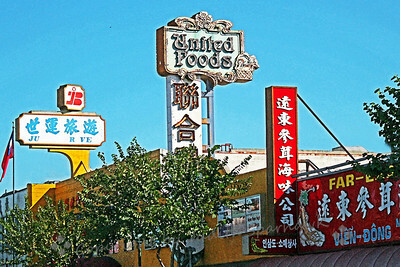 Signs of Chinatown ~ These are just a few of the building signs I noted as I walked along Broadway Avenue, the "main street" of LA's Chinatown. 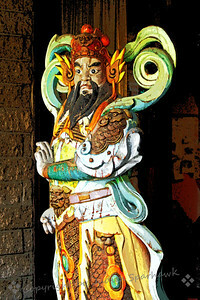 The Warrior ~ This scary looking guy was one of two statues flanking the doorway of what appeared to be equivalent to a senior center. 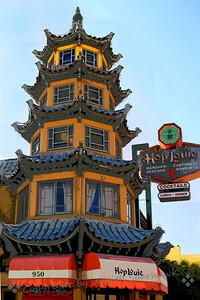 Hop Louie ~ This intricate tower building houses Hop Louie, a restaurant off of Central Plaza. 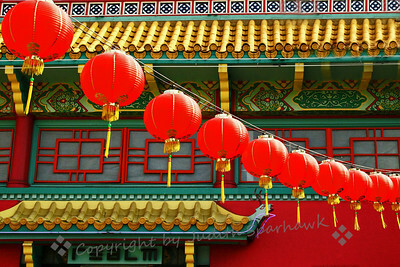 Lanterns in the Square ~ The red lanterns look so festive strung from one building to another in the central square. 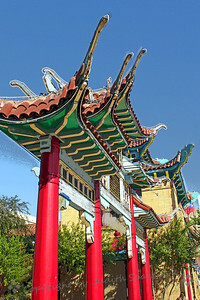 Central Plaza Gate ~ This tall ornate gateway marks the entrace to the Central Plaza. 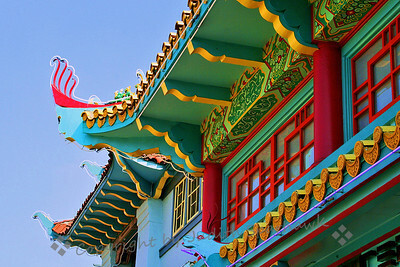 ~ There are many interesting places to visit in LA's Chinatown. 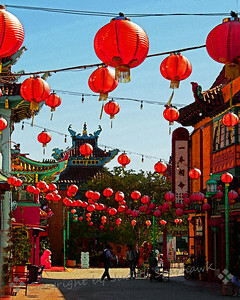 On Central Plaza, there are beautiful buildings housing shops and restaurants. 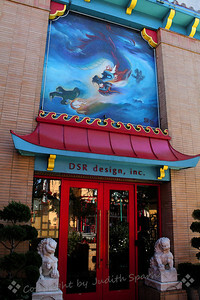 Dragon House ~ A design group is housed in this building with the magnificent dragon painting. Outside the door is a pool and fountain with sculptures. 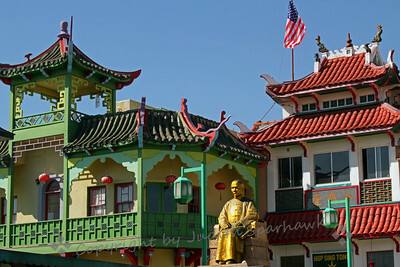 ~ This statue is in LA's Chinatown, and is a tribute to Sun Yat Sen, the man instumental for the origin of the Republic of China. He looked quite at home with the intricate architectural detail all around. 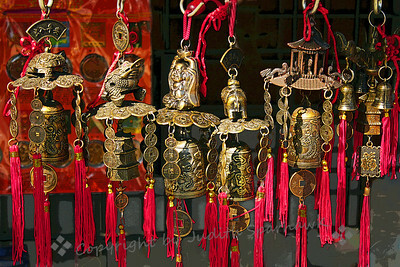 ~ These brass and red fringe decorations are for sale everywhere, in large and small shops. This display was hanging outside of one of the shops. I liked the details and designs on the brass, and of course, the bright red color. 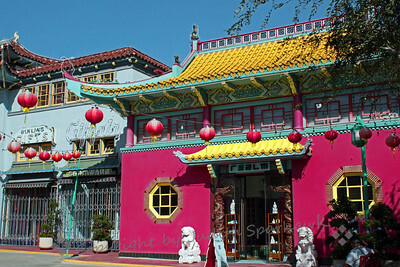 ~ This tiny shop in LA's Chintown featured many decorative and novelty items. 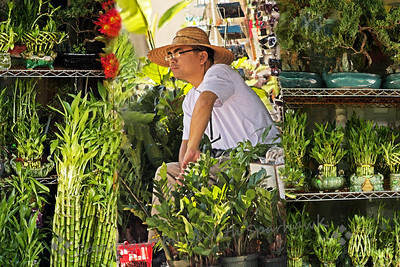 It was just a few feet wide and a few feet deep, and customers could view the entire shop's wares standing outside. 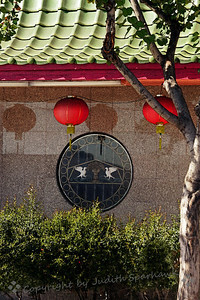 ~ I liked the window in this building, the red lanterns and their shadows cast on the building. Golden Dragon by the Golden Dragon ~ I loved the coincidence that brought me across from the Golden Dragon Restaurant just when this New Years golden dragon came by in the parade. 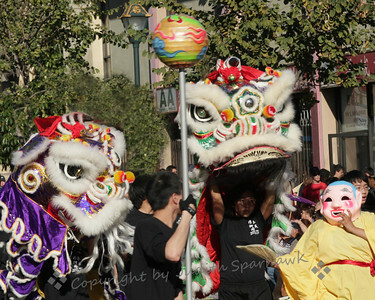 Being year of the dragon, there were several dragons in the parade. This was one of my favorites.